This all-tube tone machine cranks out fabulous lead distortion and tight crunch exactly like the original model from the 1967 to 1969 era. Inspired by Pete Townshend's unquenchable thirst for volume, this guitar amp head features 100W of power from 4 EL34s and 3 ECC83s in the preamp--the exact configuration of the original. True bypass series FX loop, 3-band EQ, and presence control. The 1960TV speaker cab has an angled front; four 12" Greenback speakers; and a warmer, thicker sound than the 1960A. 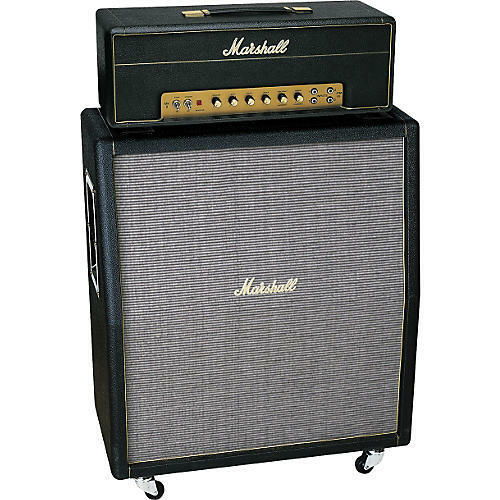 This 100W, mono, 16-ohm cabinet is 3 inches taller than a standard 1960A 4x12 cabinet which results in well defined mid range and a lowered resonant frequency for more prominent lows. The 25W Greenbacks are less in your face than the 75W Celestions in the 1960A. Although not a reissue--it was never offered in the past--this cab recreates the classic look and tones of yesteryear.